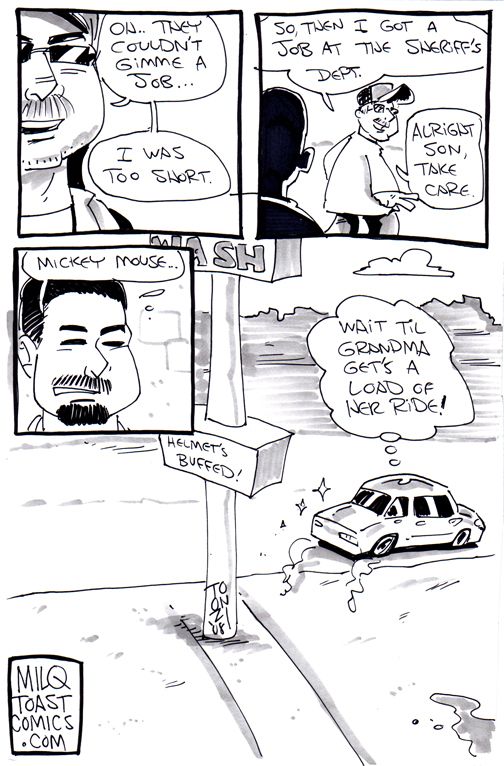 Here we go to round out the latest of my old Sunnyland strips. Meanwhile, here in Houston, the drought waxes on and the heat is coming to dog-pile all of us. Hopefully, you have an A/C unit or yer in a part of the world where the heat is not problem. I'm still fighting the urge to turn on my A/C unit. How long can I make it? 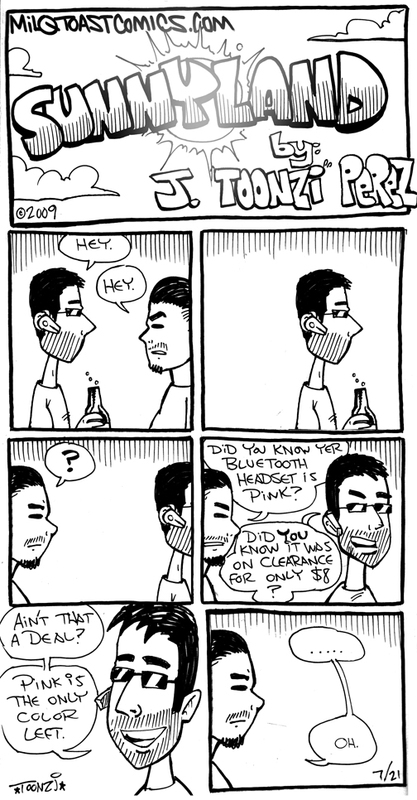 Yeah Yeah Yeah, I have a pink bluetooth headset, what, ya wanna fight about it? 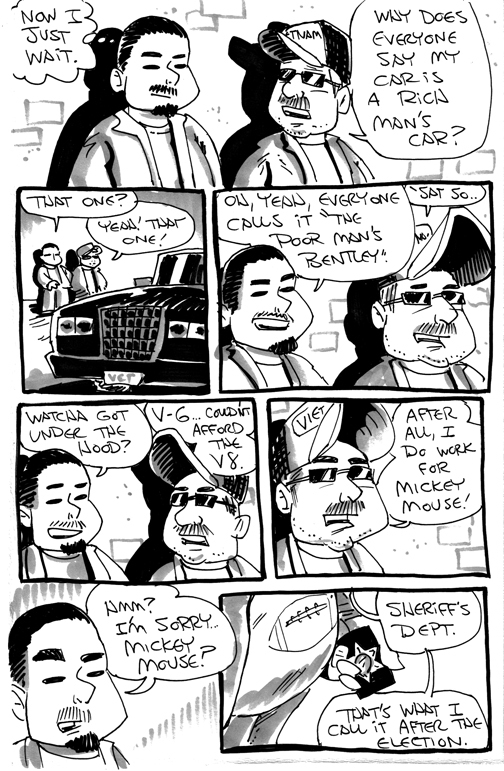 Here's a strip darker in tone. Ever watch the Wizard of Oz and on the lion's turn to sing his song do you notice how conveniently they pull the makeshift cape and crown when mentions being king? Or how there's a carpet conveniently there to roll out? Okay, for this last strip, it's a doozy: four pages. Okay, but not only that but it touches on local politics. 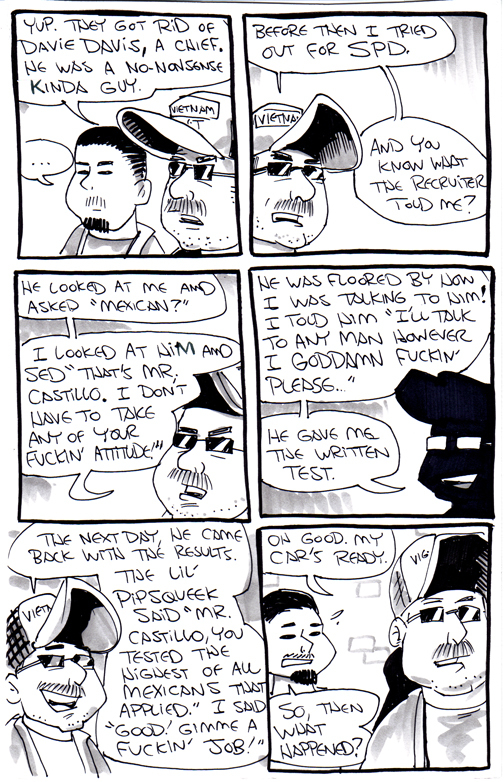 Okay, so I like dissecting some issues and politics, but I really had no intention of writing a political strip. Just an anecdote, no punch line. 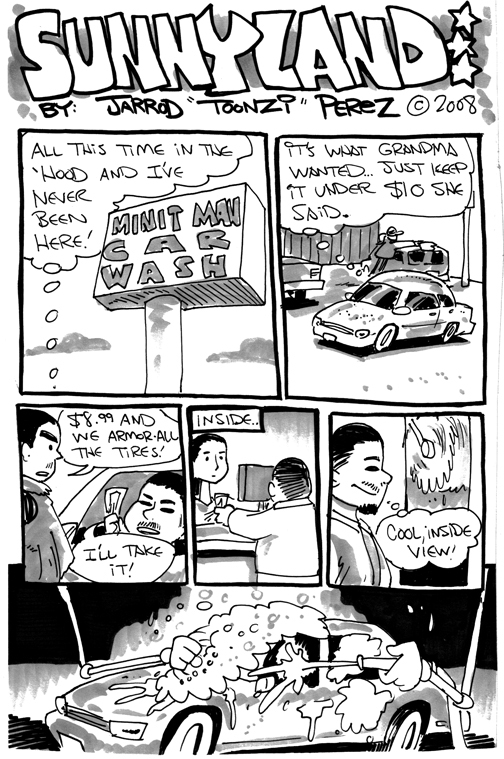 This really happened when I took my grandma to the doctor and took her car to get washed in the meantime. Yeah, true story. I didn't know who he was until he flashed his badge. And he really spoke that way too, cussing and attitude and all. So, here’s to Officer Castillo, and hopefully next time i get pulled over in the ‘hood it’ll be by him, and hopefully he’ll remember who I am, which I’m not really counting on. For the sake of keeping Sunnyland fictional, I changed the sheriff mentioned's name to Davie Davis. In actuality he was talking about former Harris County sheriff Tommy Thomas being a 'no non-sense kinda guy'. He referred to the current HC sheriff Adrian Garcia as 'Mickey Mouse' in that arrogant, condescending way. Click the links and you decide. That about wraps up the back strips in Sunnyland. Next time I post Sunnyland it'll be something ya never seen.